Led by veteran Rachel York as nightclub singer/evangelist Reno Sweeney, the national tour of “Anything Goes” gets rave reviews for a lively song and dance fest despite the creaky (although updated) script that accompanies the great Cole Porter score. Written in 1934, it’s no wonder the well-worn plot doesn’t relate to our techno-filled world but oh, that wonderful music. Hits like the title tune, “I Get A Kick Out Of You,” “Blow, Gabriel, Blow,” “De-Lovely,” “Friendship” and “You’re The Top,” among others, makes this a non-stop hit parade. Combined with the crisp direction and out of this world choreography of Kathleen Marshall, you can’t help but get swept up in this crazy cruise that features romance on the high seas. Rachel York is simply tireless. She shines in number after number including the exhausting “Anything Goes” that closes the first act. Not many shows get two standing ovations including one at the Act I close, but this one does. Her energy sparks the show but the rest of the cast chimes right in. Josh Franklin is an energetic Billy Crocker who is in love with Alex Finke’s Hope Harcourt. Although we know she shares the love, she is engaged to a “sensible” millionaire, Lord Evelyn Oakleigh, played with a superb stiff upper lip by Edward Staudenmayer. Not helping true love win out is Hope’s mother, Evangeline Harcourt, played perfectly by Sandra Shipley. Fortunately for the paper-thin plot, she is being wooed by an old flame, Dennis Kelly’s Elisha Whitney. Rounding out this wacky cast of characters is Fred Applegate as a riotous Moonface Martin (public enemy No. 13). All these folks make for a silly shipload of mayhem and music. Highlights include the fun duet (with a built in encore) of “Friendship” with Moonface and Reno, a delightful song and dance by Hope and Billy to another Porter standard, “Easy To Love,” the bright and powerful “Blow, Gabriel, Blow” and, of course that exciting title number that gets almost everyone involved. Although difficult, even with the updated script, to make “Anything Goes” a viable show for today’s audiences, the spirit and the ’30’s musicals helps buoy it along and with such a tuneful score, it really can’t miss. Thanks to a brilliant cast and the innovative choreography of Ms. Marshall combined with excellent execution of same, this is a show that suddenly becomes a treat for everyone. 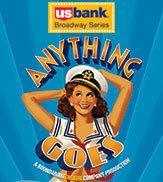 “Anything Goes” plays at the Fox Theatre through June 9th. Contact Metro-Tix for tickets and plan to attend this final musical of the season at the Fox as they end on a very happy note. This entry was posted on May 31, 2013 at 9:43 am05 and is filed under Uncategorized. You can follow any responses to this entry through the RSS 2.0 feed. You can leave a response, or trackback from your own site.